We are looking at a prospect that is seeking recruitment acquisition finance for a business that they are seeking to purchase. I highlight this as a reminder of how invoice finance can be used to fund company acquisitions. In this case it is a recruitment sector company, however the same approach can be applied to any sector. There are two possible ways in which you can structure this type of invoice finance to enable an acquisition. Firstly, if you have an existing business you could use the debtor book of the acquiring business in order to assist with raising the purchase price. Prepayments against a debtor book could release 85% of the total value of debts, or even more in some cases, that could assist with the cost of the acquisition. The second option is to leverage the debtor book of the company being acquired, and release up to 85% of the value of their debtor book in order to fund the acquisition. This can be a useful method of raising acquisition funding if you don’t have assets to use as security for a loan or bridging finance. 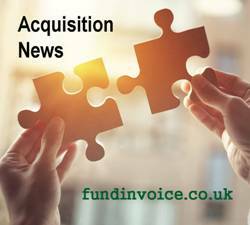 Please call 03330 113622 to discuss you requirements for raising finance to fund an acquisition.